Had the Kosi river not breached its eastern embankment at Kusaha last year, 2008 would have gone down as a drought year in North Bihar. The rains were scanty and there was virtual drought after the breach occurred. That is why the Kosi hit only 3.3 million people across five districts, 35 blocks, 993 villages and an area of 368,000 hectares (ha) and 527 people were killed. 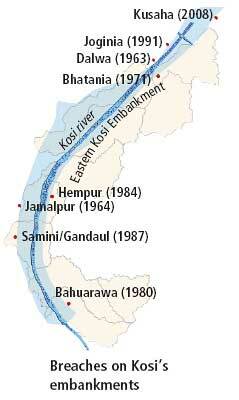 Among Bihar's rivers, the Kosi's sediment load is high and it meanders. It was embanked in late 1950s and made to flow in a channel so that 214,000 ha outside the embankments could be spared the seasonal flood. These embankments are nearly 125 km long on either side and are spaced at an average width of 10 km apart. A barrage was constructed to regulate water for irrigation and the embankment was extended upstream.It is in these extensions, called afflux bundhs, that the breach happened last year. The embankments were to stop spilling of floodwater, but they also prevent the sediments from escaping. This has raised the riverbed, forcing the embankments to be raised accordingly. But there is a limit to raising and maintaining embankments. The riverbed rises an average of 10 cm each year, where the breach took place. It was flowing five metres higher than the level at the time the river was embanked--this makes for an unstable river that can easily breach embankments, which also prevent rainwater from draining into the river, causing water logging outside. On August 18, 2008, that's what happened for the eighth time (see list on map). And this was when the amount of water in the river was less than a sixth--15 per cent--of the flow that the embankments were designed to endure. After the breach, nearly 90 per cent of the water flowed through a new course the river had carved for itself outside where it had been engineered to flow. "Nothing short of immediate plugging of the breach was acceptable to the people hit by the floods who were living in the new floodplain of the river," said Gautam Chaudhary, a resident of Birpur on the protected countryside of the eastern embankment. "They were not used to such floods after the embankments were built. The boats are not there because they were not needed; people have forgotten how to swim." Had the Kosi not breached its sides and run through its designated course, it would have inundated 414 villages (34 of them in Nepal) that live within the embankments. When the river was engineered, it was assumed these villages would get rehabilitated in the land freed from the Kosi's seasonal floods, but they would be able to cultivate their lands within the embankments during the lean season. This did not prove very practical; most residents returned to their ancestral homes. "Punarwas to banwas hai" (Rehabilitation is exile), said Manoj Chaudhary of Saharsa district's Murali village, located within the Kosi embankments. People choose to stay where they can earn a living. Most migrate seasonally for supplementary income. The river has three distinct reaches. The lower reaches were embanked in the 1950s and the upper reaches in the 1970s. The middle was left untouched because the river was said to be unstable here. In 2006, out of the blue, the current government criticized its predecessor and talked of providing succour to the people of the middle Bagmati basin. It decided the river had matured here, and started building embankments. It is well known that rivers which carry such high sediments take centuries to stabilize in a channel. Government's figures show the Bagmati has breached its embankments 20 times in the past 20 years; on an equal number of occasions, the embankments were breached by people within or just outside them to drain flood waters or logged waters. "Rising riverbed and water logging outside is the natural outcome of embanking rivers," said Ram Swarth Rai, ex- mla of Belsand in Sitamarhi. "If the river is prevented from spilling, it will either breach the embankment or the people will cut it." He reminded this is what happened in 2001 in Surgahi village on the western embankment of the Bagmati. "The river obliged the villagers before they could cut it. Embankment busters had approached me to save them from any police harassment," he said. The Mahananda is a boundary between Bihar and West Bengal. In 1998, irate villagers of Shibganj, located within the embankments in Katihar district, cut the embankment after the rising flood waters became intolerable. The floodwater that gushed out of the gap spelled doom on Barahiya Parti and Koch Khali villages, where the water tried to re-enter the river, smashing the embankment. Such incidents are par for the course. Villagers on both sides sat together and reached a consensus--for varying reasons--to oppose the government if it tried to plug the breach. They might have sorted out their problems but the water through these gaps is destined to submerge the blocks of Pranpur, Azamnagar, Amdabad, Manihari and Dhankhora. The embankment is not in good shape of repairs. The embankments on the Kamla are restricted to Madhubani district. They are notorious for the large number of breaches any given year, right since their completion in 1962. The people here have acquired an expertise in breaching the embankments in a way that the villages do not get destroyed and the fertile silt deposits on their fields. "Has the government ever bothered to assess the cost of the earth that the river puts free of cost on the countryside after a breach? asked Rameshwar Sah of Gunakarpur village. There was an unprecedented flood in the Burhi Gandak in 2007. There were seven breaches in the Bagmati embankments, 14 in the Kamla-Balan embankments, five in the Burhi Gandak, three in the Masan embankments, and one each in the Bhutahi Balan, Khiroi and the Kosi. The government response was a proposal to raise and strengthen the embankments. Its quixotic approach is illustrated in the handling of the Bhutahi Balan, a small river in Madhubani district. Flash floods occur in this river without warning and disappear equally quickly before any remedial action is taken--hence the name Bhutahi, meaning ghost. Its western side is embanked, so flood waters push to 52 villages east of the river. People here have demanded an embankment on their side for a long time. The government obliged, but railways authorities objected. For, if the embankment is completed, the waters would threaten a railway bridge. On June 18, 2009, the district administration went to a village on the bank of the Bhutahi Balan for a mock drill in disaster management. Not prepared for what they thought was a theatre of the absurd, the people chased away officials, who returned after completing the formality of driving a motorboat through whatever water was there in the river. Government engineering actually keeps disaster in place.